Auckland Diocese: Baradene College, Auckland: Chelsea Sharp has been selected for the Touch NZ 2019 U16 mixed team. Jorga Gantley with her medal. Carmel College, Auckland: Sionann Murphy (Y10) broke the NZ U17 Para records in both shot put and discus at the Auckland and Waikato Championships. Natalya Carter represented NZ at the Oceania Junior Triathlon Championships, she finished 11th overall. 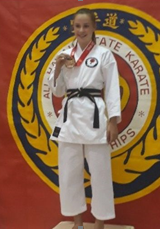 Jorga Gantley (Y9) competed at the 59th Hawaiian Karate Championships, competing against girls from Hawaii, USA and Japan. She came 3rd in her Kata division, 4th in Kumite (fighting) and 5th in the 17 Year and under open Kata division. St Peter’s College, Auckland: Caleb Laiman (Y12) was a member of the U16 Pacific Invitational Tag Football team that won the NZTFI Junior Oceania Cup Tournament. Hamilton Diocese: Aquinas College, Tauranga: Connor Farrell competed at the NZSS Open Water Swim Championships and came first in the first ever Amphibian race – a 500m swim followed by a 4.5km run. Sacred Heart Girls’ College, Hamilton: Paige Arnott (Y9) has been selected to represent NZ in Water Ski Racing. She is in the Under 20 NZ Water Racing team. 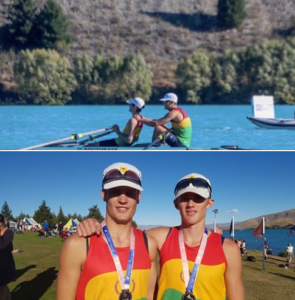 St John’s College, Hamilton: Mitchell Evans and Finn Hamill won silver in the Premier Lightweight Double Skulls at the National Rowing championships. Campion College, Gisborne: Felix Sparks was a member of the gold winning U13 Tauranga Basketball team at the Māori Nationals. Amelia Arthur won gold in the U11 Girls Beach Flag competition at the NZ Surf Life Saving Oceans National U14 Championships. Palmerston North Diocese: Cullinane College, Whanganui: Raycena Baron, Zakisa Kemp, Tumanako Sciascia and Matua Vaan Rauhine competed at the National Kapa Haka competition Te Matatini. Francis Douglas Memorial College, New Plymouth: At the Surf Lifesaving NZ Ocean’s 19 event, Callum Gordon (Y8) won gold medals in the U12 Beach Sprints, the surf Race and the Diamond Race. Zak Johnson won the U13 Beach Sprints. Wellington Archdiocese: Sacred Heart College, Lower Hutt: Chole Bothwell (Y10) who has been selected as a violinist for the NZSS Symphony Orchestra. Mia Scrimgeour (Y11)competed in the National Maori Golf Championships and won the match play in the Women’s Division. Christchurch Diocese: St Joseph’s School, Temuka: Brodie Young won four ribbons at the South Island Swimming Champs. She won 1st in 100m freestyle, 1st in 200m breastroke, 2nd 50m butterfly and 3rd 100m butterfly. Dunedin Diocese: Kavanagh College, Dunedin: Sebastian Hook has been selected for one of the NZ Symphony Orchestra National Mentoring Programme 2019 for trombone. 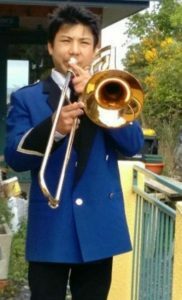 He will receive tuition to develop his technique and knowledge of orchestral music and orchestral playing from principal trombonist David Bremner. Sebastian has also been selected as a violin section player for the NZ Secondary School’s Symphony Orchestra for 2019. Aiden MacRae won three gold medals and four bronze medals at the South Island Surf Nationals.